Hawaii’s blue waters are home to many beautiful fish and wildlife — including five species of sea turtles. While exploring the ocean you might spot the Green Sea turtle, Hawksbill, Leatherback, Loggerhead, or Olive Ridley. Olive ridleys, Loggerheads and Leatherbacks prefer deep offshore waters. The Green turtle is more easily spotted near shore and can sometimes be spotted on our tours. The Hawksbill turtle likes to nest on the main island but is much rarer. Sea turtles are ancient reptiles. They have called the ocean home for over 75 million years and knew our islands long before we did. While all five species might be spotted around Hawaii, the Green sea turtle, Hawksbill, and Leatherbacks are true natives to the island. Green sea turtles are mostly vegetarian. They like to munch on limu (an algae) that grows on coral reefs and rocks found in shallow waters. Their upper shell is dark with olive or golden flecks. At full size these gentle giants can group to be almost 200 pounds. Every few years they migrate hundreds of miles to mate and nest in the Northwestern Hawaiian Islands. Hawksbill can be found around the islands of Oahu, Molokai, Maui, and Hawaii. These turtles can reach up to 200 pounds as well. They use their long narrow beaks to probe for food and like to eat invertebrates, including sponges which can be toxic to other sea animals. Hawksbill meat is poisonous to humans. 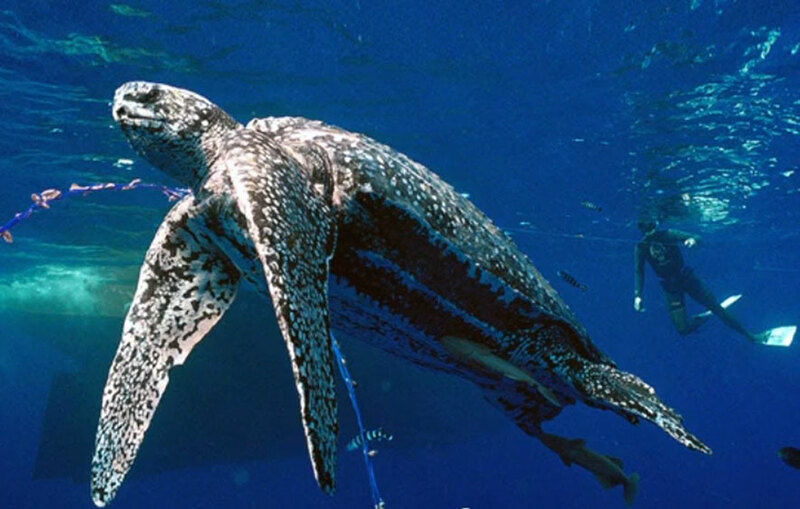 The Leatherback is the world’s largest turtle and can grow to weigh 2000 pounds! These turtles like to swim in the deep offshore waters and eat jellyfish and other invertebrates. The Leatherback is the only sea turtle to lack a hard shell. While their numbers had been dwindling; new protection laws seem to be working and an increase in this species population leaves many hopeful they will call the Pacific home for many more years.